This small plugin updates dates on every page/post of your site. We’ve released v2.0 of this plugin. It’s more advanced and has lots of new interesting features like schema markup and option to set the amount of pages to update daily. How it will help you to get better rankings? There is an article about “Google Freshness” factor written at Moz.com that will describe better how important this factor. Simply saying sites with fresh dates get a chance to rank higher. So if you have for example a mass generated site(not SERP.farm site) this plugin will update all dates at all your pages/posts. BTW this feature is already integrated in our mass page generator plugin. 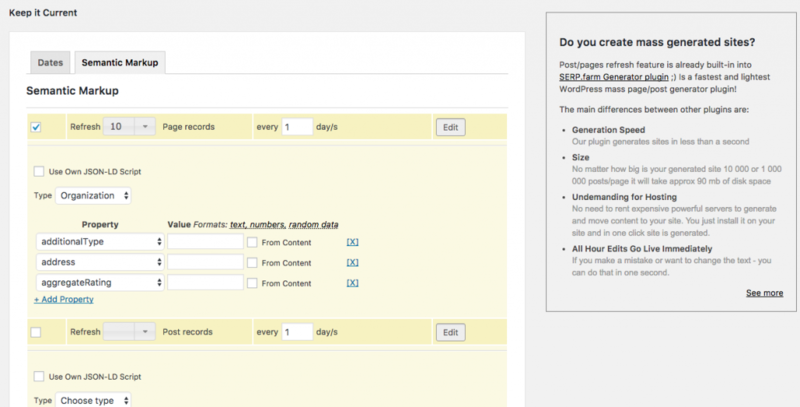 There is a lot of hype about date refresh WordPress plugins. It’s a simple easy to do plugin. So we decided to make a FREE one for you. So tell about it to others and get your download link for FREE. And special thanks to Alexander Read for feedback and feature ideas! Thank you for sharing the link to our post. Do you create mass generated sites? SERP.farm is a fastest and lightest WordPress mass page/post generator plugin! – edit. All your edits go live immediately. If you make a mistake or want to change the text – you can do that in one second. List 150 sites that will help you to increase your rankings.